The Defence Headquarters on Sunday said an unconfirmed number of Boko Haram members fell to the superior power of the military in the ongoing offensive in Sambisa forest. The military authority also said its forces on Saturday captured and destroyed 10 additional camps used by the terrorists. This is contained in a statement issued by the Director of Defence Information, Chris Olukolade, on Sunday in Abuja. Olukolade said the “Dure” camp which was one of the most prominent camps in the forest witnessed the fiercest battle as troops descended heavily on it before it finally fell. He said four of the camps were located in a place called “Iza” within the forest, while three others were noted to be recently established by the terrorists before the assault began. “One soldier died from one of the land mine encountered in the operation, while two others were wounded. The terrorists lost a number of vehicles mounted with anti-aircraft guns as well as armoured vehicles. Some of the terrorists who escaped from the camps died as they ran into troops’ ambush in some escape routes from the forest,’’ he said. Olukolade further said some of the fleeing terrorists had engaged in suicide missions at Bitta where they encountered the Nigerian troops and Kiskeru across the border in Niger Republic. 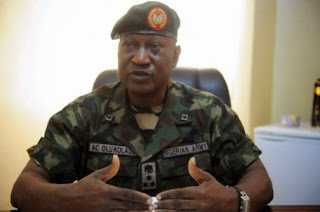 He said the operation to clear the terrorists in Sambisa and other forests in the zone were ongoing, as troops in all fronts were placed on guard for fleeing terrorists. He added that the Nigerian Air Force had maintained an active air surveillance to track the movement of terrorists.